I've teamed up with Cosori to review their 6.5 quart 11-in-1 Programmable Multi-Cooker. Having never used a multi-cooker before, I was most anxious to try the 'bake' setting. I made my Chewy Granola Bars(swapping blueberries for cranberries and coconut for pumpkin seeds). And, it most definitely worked! I was positively excited to try this multi-cooker for the first time, as I was anxious to see if it truly was capable of performing all of the functions promised. The result? It most certainly is. I wanted to try out the Cosori Multi-Cooker by testing a recipe that I make rather frequently, so I decided to try baking my Chewy Oat Bars for my little ones. And lucky me, this multi-cooker arrived on one of the hottest days of summer, rescuing me from having to use the oven! The Cosori Multi-Cooker was extremely easy to clean and set-up rather quickly! I plugged it in, whipped up my recipe, pressed it into the provided non-stick cooking pot, then followed the easy instructions in the provided manual for the 'bake' setting. When it was finished, I lifted the lid and was pleasantly surprised to find what resembled my often created Chewy Bars! I was amazed. Overall, I have no doubt that I will be returning to this multi-cooker when I need to be more efficient in the kitchen, want to save myself from the heat of the oven, or to make cooking while traveling that much more of a possibility. I have since tried the slow cook & boil functions and they work beautifully as well. And I so look forward to trying the yogurt function next! I think you will find yourself pleasantly surprised with this little kitchen gadget as well and I look forward to you telling me your experiences! 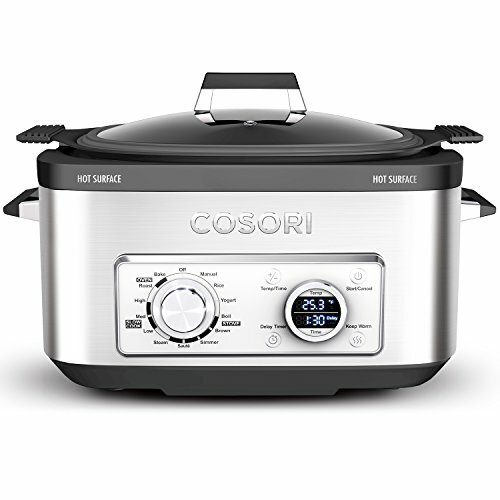 Read more about this multi-cooker on Cosori's website HERE.